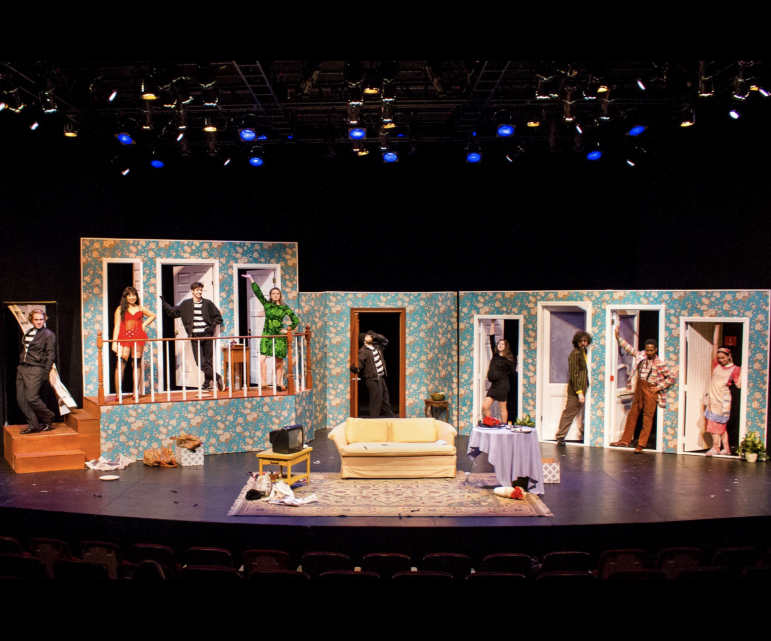 This past weekend, Cap & Bells put on a production of Noises Off – a famous comedy of errors. Students and community members alike were treated to a three-hour witty, slapstick comedy at the ’62 Center for Theatre and Dance. 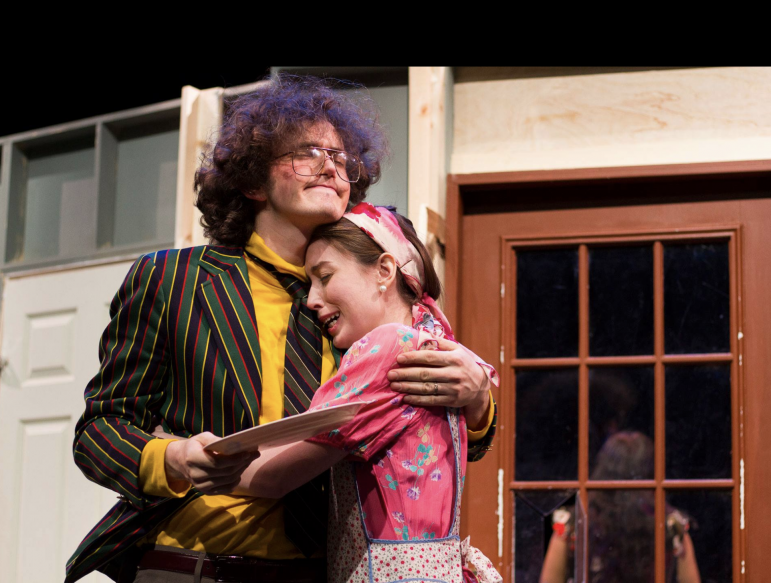 The premise of the show is simple, albeit quite meta: A travelling theatre company is attempting to put on a comedy that focuses on the farcical interactions between numerous people who have all illicitly entered a house they each believe to be empty. The production takes the form of three acts. The first one follows their dress rehearsal, the second a mid-season production of the play-within-the-play Nothing On and the third a showing of the play near the end of its run. The real comedy comes, though, from watching the theatre company slowly unravel backstage, which begins in act two. Many of the “actors” had their own hilarious idiosyncrasies – such as one whose nose would start bleeding at the mention of violence and another who frequently lost her contacts. As the cast members attempted to put on their show, the audience watches them frantically try to handle an alcohol problem, a director who sleeps with two cast members and impregnates one and a jealous rivalry over a sixty-year old jaded actress. The sheer absurdity of it all had the audience laughing to no end. Directed by Nadiya Atkinson ’21, the play, which Cap & Bells put on as its annual Winter Study production, featured nine actors and a host of stage hands ranging from first-years to seniors. Gigi Gamez ’22, who played the character of Brooke Ashton, was struck by the closeness between cast members. The show featured an elaborate number of props, including multiple plates of sardines that kept moving on and offstage. Mastering timing and the movement of props took significant rehearsal time. “We were at rehearsal every day for at least three or four hours – which seems like a lot, but honestly, for this show, you really had to give it your all. It’s just so fast-paced and you have to get the timing exactly right each time,” Gamez explained. Even so, the exceptional cast really made the action of the play come to life. Director Atkinson was astounded by the work ethic of the cast. Another challenge was the complicated set. During the first and third acts, the audience sees the set of the play the theatre company is presenting, but in the second act, audience members are treated to a back-stage view of what is happening with the theatre company. Atkinson articulately described the stage. “What an incredible, intense, wacky journey: it was truly an honor to be a part of it,” Atkinson concluded. And indeed, it was an honor to witness such an intricate and hilarious production as well.